My name is Eamonn Powers and I am a junior at Holliston High School in Holliston Massachusetts. For my National Honors Society project I am working on holding a High School Fly Fishing Tournament. 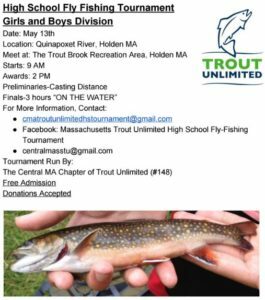 I am doing this with the help of the Central Massachusetts chapter of Trout Unlimited, a national trout conservation organization. The tournament will be held on May 13th at the Trout Brook Recreation Area in Holden MA. The goal of the tournament is to both introduce fly fishing to high school students as well as give a competitive environment to seasoned fly fisherman. It has also been created as a means of spreading awareness of the organization and its cause among a younger generation. This will be the first ever high-school fly fishing tournament sponsored by Trout Unlimited. Details below. Please forward this post to any and all young people you know. I have great hope for our future when I see young people also becoming stewards of our fisheries.